Being very new to BISDS culture & system, they do not know what to expect or how Sanghika Dana was conducted here in BMV or rather in Malaysia. 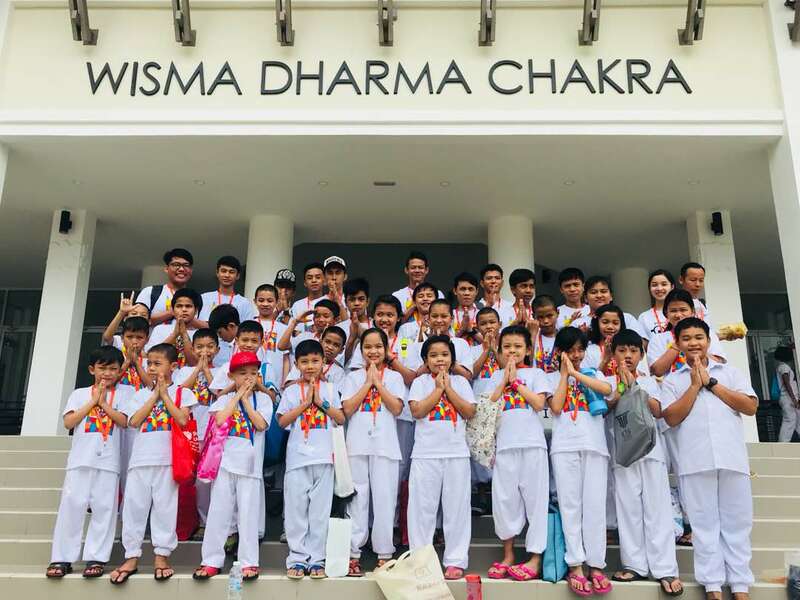 These may be the thoughts of 40 Myanmar students who attended the Sanghika Dana organised by BISDS in BMV on 05 August 2018. BISDS has welcomed 41 Myanmar students and 3 Supervisors from Mon Refugee Organisation under the United Nation Program as students in the Sunday school starting from 15 July 2018. Today is their 4th day of lessons in BISDS and they have arrived before 9am in BMV to be part of BISDS team to participate in the Sanghika Dana together with all other students. Though it was raining in the morning when they left their Center in Jalan Pudu Kuala Lumpur but that did not dampen their feelings of curiosity and eagerness to witness the celebration. They came well prepared with their cutlery as instructed to be part of the recycle & reuse program to save the environment. They were delighted to receive their white pants and gratitude were shown on all their faces when they collected it from the ever so friendly and concerned Office Staff in the Bookshop this morning. Thereafter, they adjourned to the Asoka Hall of BMV for the first time. Their eyes were glowing with joy and were smiling as they walked into the hall. They were seated and waited patiently for the ceremony to start. They were so happy and excited to see so many monks and nuns walked into the hall. In fact, some of them whispered amongst themselves whether they could see Myanmar monks too. The children were given packet beverages to offer as Dana to the monks. They were delighted to perform the offerings, some were seen practicing the act of offering to the monks that were taught to them last week. They waited patiently for their turn to offer. Signs of satisfaction were seen on their faces after their offerings whilst they walked back to their respective seats. The teachers have reminded them to make aspirations and wish themselves to be well and happy after the offerings. They were happy and were very appreciative for the food served to them into their food boxes, (given to them by a kind teacher of BISDS). After they had happily finished their lunch, they left BMV into the waiting school bus to take them back to their center. They were so thankful to be part of the celebration and were so appreciative towards BISDS for what we have done for them. Today, they have experienced the act of giving and learned the significance of Dana as well as being together with all the students in BISDS. They have also shown a good example to all present for their good behavior and great attitude in the hall, where they were seen to be seated quietly in very neat rows whilst waiting for the ceremony to start and for their turn to offer as well as for their lunch. I am very proud of them.